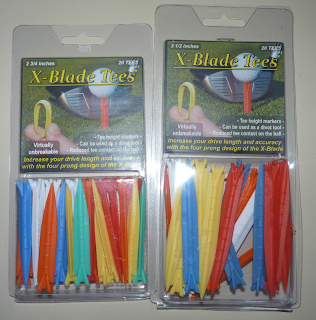 I recently got myself some of these X-Blade unbreakable tees. They are manufactured by a company called Stonehouse Design. I previously used the cheap generic tees from Target. Each hole I would have to use a new tee as the one I just hit from usually breaks. So the idea of an unbreakable tee appealed to me. The tees come in two sizes; 2 3/4″ and 3 1/2″. A pack of 20 retails for $5.99. 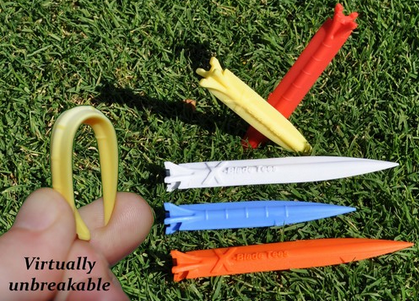 Due to the shape of the tee it can also be used as a divot tool, which is handy. The tee’s I received came in a multicolored pack but I believe you can also get them in an individual color. When trying them on the course I did find the red ones hard to pick up against the grass color – but I am slightly colorblind, so that probably did not help the situation. I think in the future yellow or white would probably work best for me. While initial testing the tee’s worked well. With each tee shot, the tee remained in the ground and did not fly 10ft from my hitting location like with a conventional tee. There are height markers molded on the side of the tee’s. Personally I did not have the need to use this feature. The top of the tee has four prongs which the ball rests on. I found that ball remained pretty stable while sitting on the tee. I tried them out over several holes of play and did not break any tee – so I guess the product does what it claims! I really like these tee’s and right now will continue to use them. My only hesitation is that the tee is pretty big, so I am curious to see how they will work with the hard Southern California ground in the summer. I have a feeling that they could be hard to push into the ground. Do they increase drive length and accuracy?? Well my swing is not consistent enough to determine that. I think they will need to be tested in a controlled environment to see if that is the case. They are millions of golf gadgets/ improvement devices etc. Many do not work or help. But I like these tees and will continue to utilize these tees and update my progress later in the year. 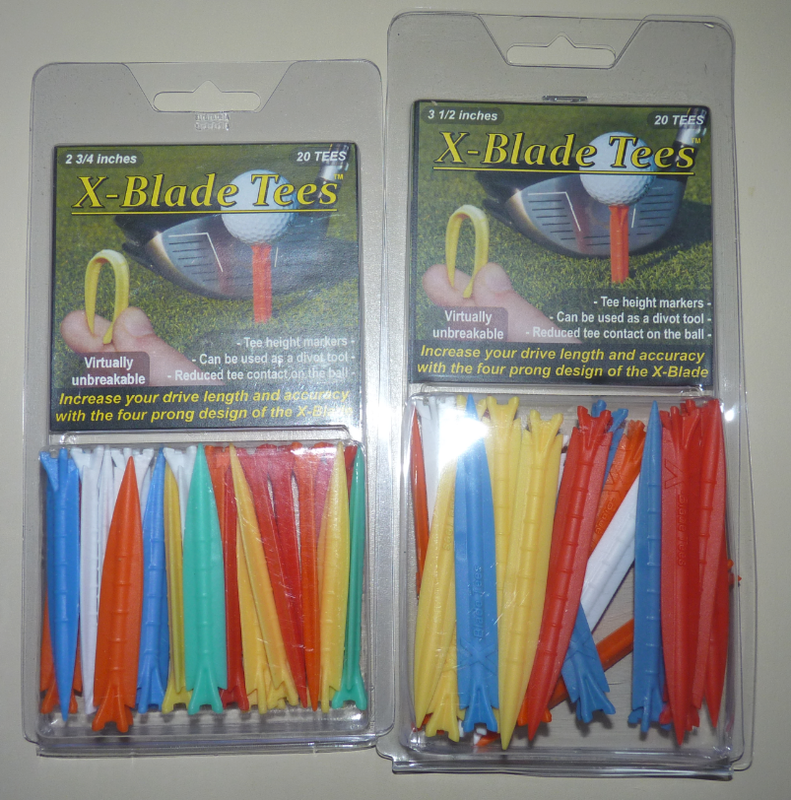 X-Blade tees can be found at many of the usual online retailers.